The roof type and material that you choose for your home will greatly influence its appearance and durability. There are a variety of roofing materials available on the market today, with one of the most popular being shingles. They are attractive, dependable and cost-effective. 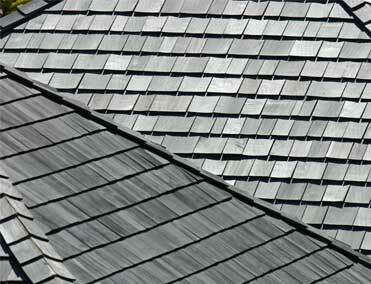 Shingle roofing is a type of covering which is comprised of elements which overlap one another. The elements will usually be rectangular and flat, positioned on the roof starting near the lower edge and then extending upward. Every succeeding course will overlap any joints which are beneath it, and shingles can be made from numerous materials, including flagstone, composite, slate or asphalt. Shingle roofing is exceptionally visible, which means it can greatly add to a building’s appearance. They will usually be constructed with materials that are available locally. Contractors pay close attention to the type of shingle they work with since it will determine the pitch of the roof and the preferred construction technique. Whereas some shingles may be installed in lath, others will require solid sheeting within roof decks. During installation, every shingle roof will be constructed from bottom to top starting with the starter course and edge seams, which will prevent leaks. Shingle installations are often performed on underlayment material like felt paper so that it is not adversely affected by snow, ice dams or rain. Why Install Shingle Roofing In New York City? Contractors based in the New York areas are comfortable working with a wide range of tools and materials, in harsh climates. Furthermore, the shingles they use are often non-combustible, in accordance with building codes. This roofing material is also simple to install and doesn’t use up a lot of energy. Shingle roofing is eco-friendly, which is a big deal in a city with more than 8 million people. Asphalt shingles, in particular, are subject to recycling, and a number of institutions specializing in shingle disposal, which reduces the impact they have on the environment. Finally, shingles, unlike plastic, do not degrade when recycled multiple times. The newest generation of shingles have a much better service life than their predecessors. For instance, when properly maintained, shingles with thee tabs can last as long as thirty years. This roofing material is among the most durable that money can buy. It is perfect for commercial or residential properties in the northeastern U.S. because it offers outstanding resistance to extreme weather conditions such as snow, rain, hail, sleet and high temperatures during summer. Many shingles also come with vents that can be used for the release of heat or moisture which gets trapped in attics. It is the roofing material of choice for those who are looking for a better quality of life. Why Choose Us for Shingle Roofing Services in NYC? A. Stewart Roofing and Waterproofing specialize in a variety of roofing services, including tear offs, repairs, shingle roof installation and reroofing. There is no job or project that we can’t handle, and we are especially adept at locating and correcting leaks. Speak with our representatives today to receive a free estimate.